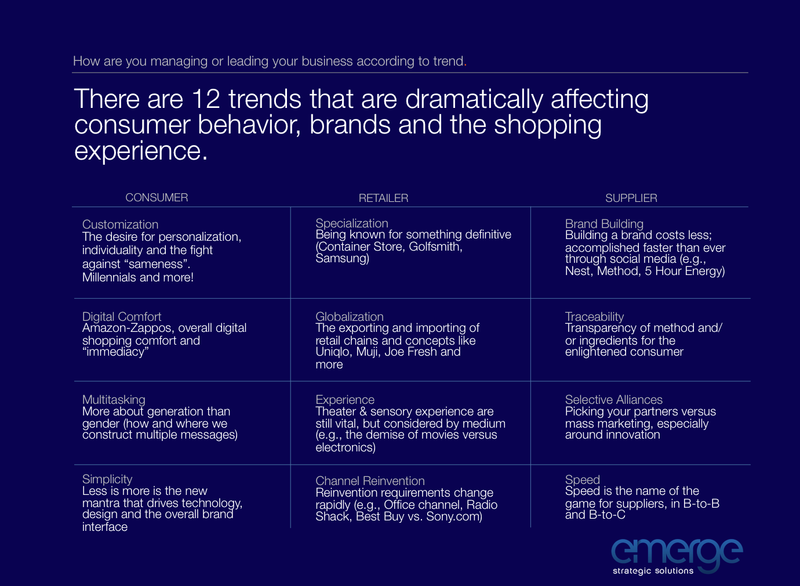 Emerge has identified twelve powerful trends that affect retailers and suppliers, and there are 4 key questions to ask yourself with regard to all of them. LEADING / Are you ahead of the trend? WITH IT / Are you on trend? BEHIND / Are you following the trend or way behind? UNOBSERVANT / Are you off trend? Let us analyze these trends with specific respect to your business and get a conversation started that will provoke your team to think differently. – There is a “new” shopper emerging who values brands differently; more experimental, juggles more and hears less. Shops more, in “stores” less. – Retail reinvention in certain channels is creating a chasm – the ones who are leading and the ones left behind.